Ultimately, will bizarre Parliaments do the country any good? This is history repeating consecutively but with a difference. A month ago we had a bizarre Parliament with members of the Opposition sitting on both sides- on the government side as well as the Opposition side. Some Opposition members held ministerial portfolios while their other colleagues were representing the Opposition with one of them holding the Leader of the Opposition post. The President of the country was then chairing the Cabinet at a time while presiding over the parliamentary group of the main constituent party of the Opposition at another. Then there came a situation which could be called as an impasse. The government was virtually at the mercy of the Opposition with the latter with its majority power in the Parliament preventing even important financial regulations from being passed. With the tampering by the Opposition using its majority power the output of the 19th Amendment to the Constitution was far different from its input.The situation pushed the leaders of the government to call for the immediate dissolution of the Parliament. After the General Election following the dissolution of the Parliament the country now sees almost the same formation of the House. Again a bizarre situation under which there is an Opposition sitting on both sides of the well of the Parliament, but without the majority power. Again some of the Opposition members are going to sit at Cabinet meetings while attending parliamentary group meeting of the Opposition- two forums normally with two different targets. The difference between the situation during the government with the so-called 100-day programme and now is that the present Opposition is a somewhat tamed one that surrendered with shattered hopes following the dashing of prime ministerial dreams of their unofficial leader-former President Mahinda Rajapaksa. The majority of them are grappling to come to terms with their new leader whom they were conspiring against two fortnights ago, almost discarding the former leader. But still they have the capacity to scuttle anything that is brought forth by the government since the latter too does not wield the majority power in the Parliament on its own. However, now the ministerial portfolios have become the bond between the Government led by the United National Party (UNP) and the main Opposition Sri Lanka Freedom Party (SLFP). Also with President Maithripala Sirisena being in full control of the SLFP while being gratefully supportive of the UNP that voted him to power, the danger of immediate collapse of Prime Minister Ranil Wickremesinghe’s minority government is minimal. However, the allocation of ministerial portfolios to the Opposition raises many more questions. One has to question as to whether the Government is gradually ignoring its Yahapalana (Good Governance) ideals put forward during the last presidential election. Following a decade-long agitation by the Janatha Vimukthi Peramuna (JVP) and recently by the Jathika Hela Urumaya (JHU), Pivithuru Hetak National Council led by Ven. Athureliye Rathana Thera and the Movement for a Just Society led by Maduluwawe Sobhitha Thera, the leaders who mobilized the masses against the Rajapaksa regime at the last presidential election had agreed to limit the Cabinet to 25 ministers and to appoint 35 Deputy Ministers. But when the 19th Amendment to the Constitution was passed a concept of “National Government” crept in with a carte blanche to future governments to increase the number of ministers at will. The amendment provides for the first time the appointment of a maximum 30 ministers under normal circumstances while allowing the Parliament to decide on the number of ministers in the event of a national government being formed. And the 19th Amendment defines the national government as a government formed by the largest political party with the support of any other party in Parliament, giving a licence to a future ruling party to get the support of even the smallest party in the House in order to increase the number of ministers. The present Maithri-Ranil government has not so far misused this carte blanche, still there is a possibility of a future government appointing even more than a hundred ministers with the collaboration of the main Opposition. At the same time, with the formation of the “national government” the country again has lost a golden opportunity to have a strong Opposition in Parliament, which is important in a healthy democracy. The number of ministers has been the bone of contention for the past three decades after the UNP government of former President J.R.Jayawardene appointed 25 district ministers for the first time apart from the Cabinet and deputy ministers. It was followed by President Ranasinghe Premadasa who appointed state ministers in addition to the Cabinet and deputy ministers. 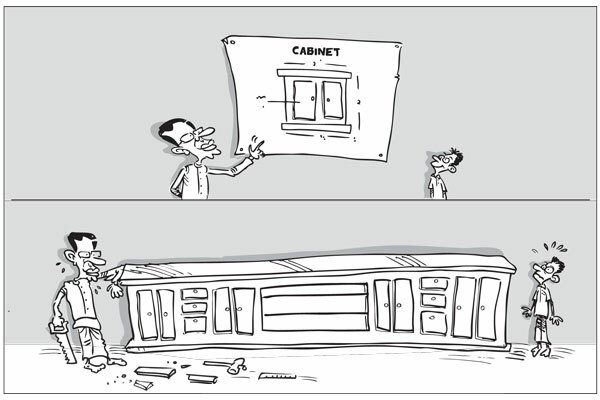 Thereafter it has been a custom for successive governments to appoint jumbo Cabinets leading to one particular government to appoint all except for one or two members of the ruling party as ministers. Former President Mahinda Rajapaksa used ministerial portfolios to break the Opposition parties and create an artificial two-thirds majority power in Parliament with which he brought in the infamous 18th Amendment to the Constitution. This led to a situation where many leaders of the government were intoxicated with power the main causes of the downfall of the Rajapaksa regime. The Cabinet during the first three decades after Independence consisted of 20 to 30 ministers and the subjects allocated had been made on a somewhat “scientific basis” according to the JHU. However, later with the expansion of the Cabinet subjects related to land, for example were given to various ministers. Land under one minister while land development and irrigation fell under some other ministers. Likewise subjects like Education, Higher Education and Education Services were divided just to satisfy the ministers. Although leaders of the present ruling party, the UNFGG promised to follow the JHU proposal to allocate subjects to ministers on a “scientific basis” they seem to have forgotten it. It is said that Politics is the art of the possible.Hence we cannot expect 60% of yahapalanaya or principles of democracy and good governance to be seriously applied. This is reality and life - we have to change step by step. No other way.